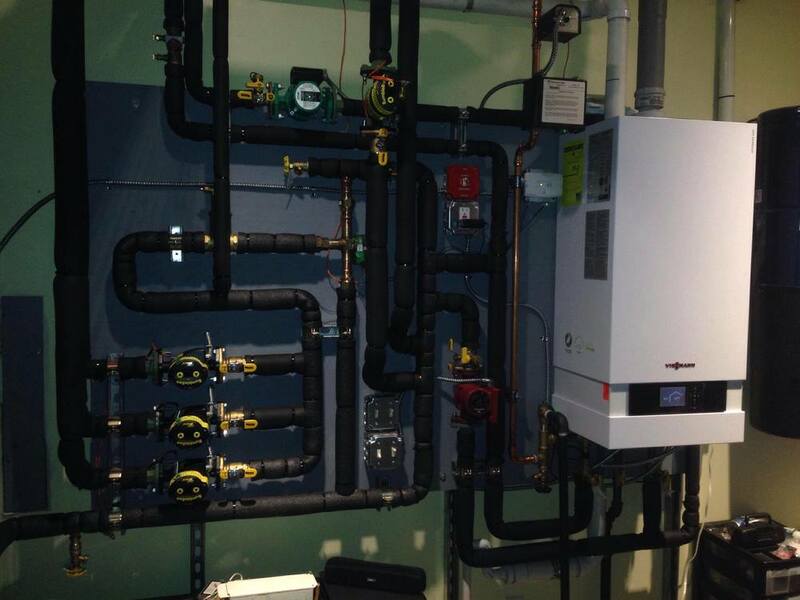 Absolute Mechanical offers a wide range of high efficiency heating installations from oil to gas conversions with steam or hydronic boilers to steam to hydronic conversions. 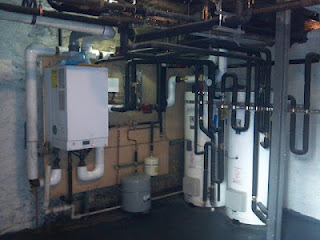 Absolute Mechanical works with the NYC Department of Buildings and the utility company to provide a turnkey transition. Absolute Mechanical will customize your new heating system to the specific needs of the building for highest efficiency and comfort. We work with our expediters and engineers to provide the NYC DOB with everything they need to ensure a code compliant installation and we work with the utility to provide our customers with the all the rebates available. The great thing about needing to replace your existing boiler is that you get to start over. You no longer need to deal with the issues of your current heating system. Absolute Mechanical starts over, we remove all the existing piping and replace it with the necessary pumps and piping for a BETTER system. The systems of the past are not always compatible with the current equipment since advancements have been made. Full System Design: Our company has an in-house heating engineer to make sure that your system is properly designed and installed and runs effectively throughout. EDR Survey and heat load calculation to ensure proper sizing of the new boiler: Absolute Mechanical goes through each room of the property and measures the size of windows, exterior walls, type of insulation, etc to determine what is the proper sizing of the boiler. If boiler is oversized it will never work properly and will cost more in the end. Cleaning of existing system: After years of use pipes become full of dirt and grime, all this must be cleaned out to ensure that your new system is not corrupted by the filth of your old one. Follow this link to see the inside of pipes that were never cleaned. Proper set up of controls: Much of the performance of a high efficency condensing system is based on proper set up. Our technicians have received training from the facilities of all our approved manufacturers to ensure proper set up for maximum comfort and savings. Proper filing and permits: Absolute Mechanical files all projects with the department of buildings so you can be confident that everything is done properly and code compliant. Filing for Rebates with Utility Company: Absolute Mechanical will assist in providing all the rebates that are available to our customers. Absolute Mechanical will engineer the entire project. 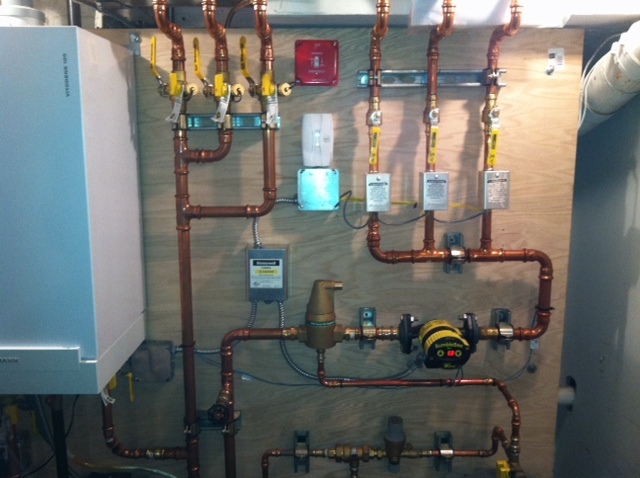 We size everything including the copper piping, radiators, controls, and boiler to the needs of the building. This is not a cookie cutter installation. Every house is different and requires different systems. Absolute Mechanical is certified to install all major boiler brands such as: Viessmann, Weil McLain, Slant/fin, Baxi Luna, Lochinvar, Triangle Tube, Burnham, etc. Many buildings have issues with their heating system. Regardless if the buildings are new or old they may have heating issues due to improper installations. Absolute Mechanical can consult and repair these issues. We have a proven history with improving both hot water systems and steam systems without even changing the boiler. Absolute Mechanical works with managing agencies, coops boards, condo boards, and building owners to review deficiencies in their heating systems due to improper installation, improper design, or just wear and tear. We listen to our customers concerns and go to the root of the problem. We don't address the symptom, we address the cause to ensure the problem doesn't return. Absolute Mechanical can advise on certain modifications that can be done to an existing steam system to improve efficiency and comfort. Sometimes conversions to gas or replacement of the boiler are not necessary to achieve savings. Many building and houses in New York were built over 60 years ago when steam was the most widely installed system. Most of these steam systems have never been maintained properly, adjusted, or repaired. Most of the boilers that were installed afterwards into these systems were done incorrectly without consideration given to existing piping, venting, sizing requirements, etc. Now steam systems are associated with the worst type of heating systems. They lack comfort, have knocking, uneven heat distribution, and so on. Few know that even a steam system can provide comfort and savings if brought to good working conditions. Many think that changing boilers from oil to gas will resolve their issues with high fuel bills and comfort. Actually a properly set up steam system can save as much as 30% off fuel bill after even a conversion to gas. If the conversion is not done properly the issues can become even worse. Absolute Mechanical has been able to save money for customers without even converting to gas just by correcting existing installations, installing proper venting, and proper radiator control through the installation of thermostatic radiator valves. There are incredibly beautiful new buildings that have been built up in recent years. However, many of these buildings have serious deficiencies in their heating systems. Residents complain from poor heating distribution such as over heating and lack of heating, loud noise, dry air, etc. There is hope for these residents. 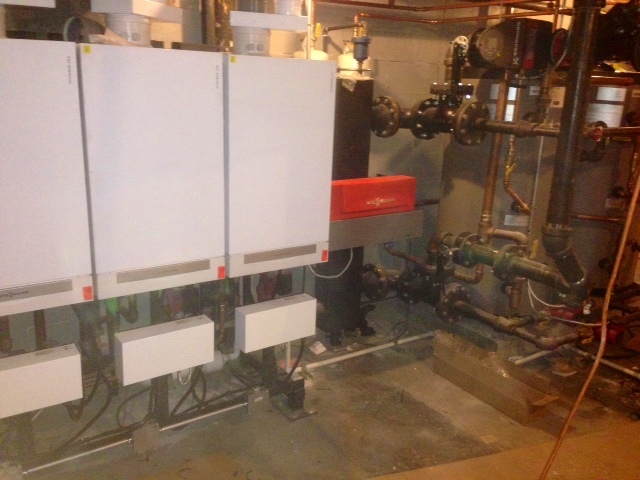 Absolute mechanical can provide an assessment of their heating system and provide solutions. Absolute Mechanical will design, assist in the design of, advise on, and supervise the building of a heating system that is built to modern heating principles effectively using the latest technology. While ideas have no boundaries, their practical application may be limiting. Absolute Mechanical can provide consulting services to designers, engineers, architects, general contractors, home owners, and installers to ensure that their concepts can be brought to life in a flawless manner. We can go through the design of the system and point out if there are an inherent deficiencies in the design that may come to light post installation. This ensures a happy contractor, designer, installer, and most importantly home owner or resident. While ideas have no boundaries, their practical application may be limiting. Absolute Mechanical can provide consulting services to designers, engineers, architects, and general contractors to ensure that their concepts can be brought to life in a flawless manner. We can go through the design of the system and point out if there are an inherent deficiencies in the design that may come to light post installation. This ensures a happy contractor, designer, installer, and most importantly home owner or resident. Absolute Mechanical can review the design for your home's heating system and advise whether the proper measures are taken for efficiency, comfort, savings, and most importantly code compliance. For professionals installing or specifying a new heating systems we can offer design, consulting, supervision, and engineering to ensure that your customer receives the most out of their system. Heat loss calculations to determine proper sizing of the system - Often times the problems we see stem from the incorrect boiler installed for the incorrect application. When a boiler is too large it will short cycle and reduce efficiency as well as comfort of the system. Piping sizing calculations - Proper sizing of the pipes is extremely important to ensure that the water flows at the correct velocity and pressure. Electrical control design - Electric and control wiring determines how each component of the heating system operates and in what sequence. It also controls the temperatures, pressures, and flows in each part of the heating system at a given time. Proper system sequence of operation - We will provide the proper sequence of operation between heating, hot water, and any other systems for the most efficiency. As homeowners it can be very daunting to qualify a contractor and be confident that you will get the system you want and need. Absolute Mechanical is offering homeowners a way to confirm that they will get the best system while using their favorite contractor or engineer. If these items are not available we will provide them for the contractor or engineer as they are essential in proper design and installation of the heating system. We will act on owners behalf to oversee installation process and make sure that everything is done according local codes, manufacturers requirements and best trade practices, that no shortcuts is taken on side of contractors and make sure owners get maximum results in their installation process. We will also supervise the installation to confirm that from start to finish the product is exceptional. We can also provide the following for your installation for a turn key system installed by you contractor, designed by Absolute Mechanical.